Do you order from the same pizza place every weekend? Maybe you’re lazy or bored or just can’t figure out what to have for dinner. Do you order that giant pizza for just you and another person, and find yourself eating too much of it…just because it’s there? Maybe you wonder how that one item you ordered costs so much, for so little ingredients. Or you might wonder why you bought that bland frozen pizza that seemed to have all those fake ingredients on it. We MAKE our own pizza! YUMMMMM! It’s super easy to make your own pizza at home. Pick out your favorite ingredients and pizza dough, and you’re good to go! The fun part (well, there are many fun parts, but I’ll get to that) about making your own pizza at home, are the seemingly unlimited choices about what to make your pizza with! You can make your own dough from scratch, pick up pre-made dough (Trader Joe’s has a yummy one), or even buy a Boboli pie crust. An additional option, is gluten-free pizza dough. 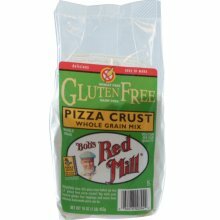 There are so many great gluten-free foods available now, and pizza dough is one of them! Depending on your mood, you can use pizza sauce, pesto sauce, olive oil, or even a white sauce for your base. Now the toppings…that’s where this stuff gets good! Soooooo many options! Peppers, onions, broccoli, spinach, mushrooms, garlic, pepperoni, sausage, pineapple, chicken…and tons more! We love using the lighter versions sometimes, like turkey pepperoni and turkey/chicken sausage. It’s so great to be able to choose fresh mozzarella, provolone, parmesan. Maybe you wanna get fancy with it and go with asiago, fontina, gorgonzola, ricotta! 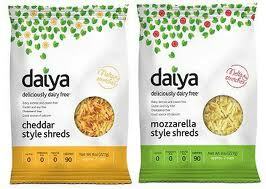 One more option is a dairy-free cheese like Daiya. Pizza may not be an option for many lactose intolerant people ordering out, but with dairy-free cheese, you can make your own at home! There are so many perks of making your own pizza at home. One of our favorite things about pizza night at our house, is the assembly of the pizza itself. We get to work together step by step on creating the pizza, deciding which toppings to use and how much to put on. 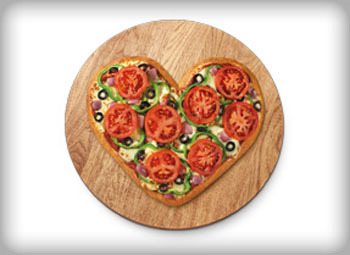 We have fun creating new ideas for pizzas all the time. One of our favorites so far, is to buy a rotisserie chicken, shred the chicken and cover the dough, add Frank’s Red Hot sauce all over the pizza, and top with fresh mozarella. MMMM! MMMM! Delish! Another tasty fave is our chicken fajita pizza. We prepare chicken and peppers like we would for a regular chicken fajita dinner, but then put all the ingredients on top of our pizza dough, and cover in cheese. Oh my gosh! That one is super good! Pizza time at home is a super easy meal, and is a wonderful way to get the kids involved in cooking too! Don’t you just hate it when a summer weekend flies by before your eyes? We had some crazy weather this weekend in Chicago. Hot to cool, sunny to pouring rain, and back again. It seemed to flip back and forth all weekend. But despite the weather, Michael and I managed to fit some fun times in. I had dinner out with Michelle, my old roomie, Friday night. 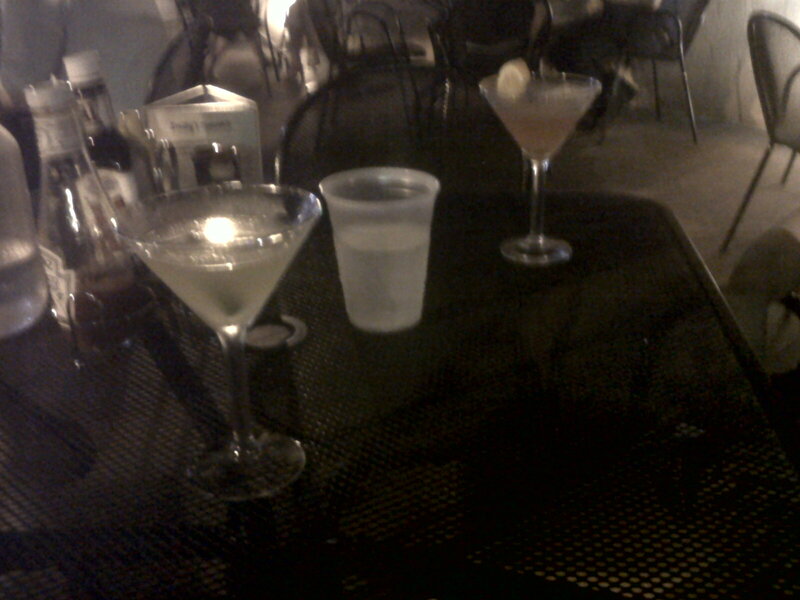 We enjoyed catching up during the beautiful evening weather on a patio and had a long leisurely meal with yummy martinis. I had a few key lime martinis. Yum! Saturday started out with rain, rain, rain, but it cleared up for us by 9am. We decided to take a nice brisk walk over to our local farmers market, despite the instant humidity that popped up. The market is about 1 mile from our apartment and we were able to pick up some fresh zucchini and three cheese foccacia. We walked up further into Lincoln Square, did some looking around, which always involves a stop at Gene’s Sausage Shop. A European market with all kinds of meats, produce, wines, beer, liquor (I found organic vodka here! ), pasta, bread, cheese, and candy never ceases to amaze us with its broad variety of items. We love looking at the wine and beer selections the most. The shop is ALWAYS busy, no matter what day or time it is, and brings all different types of people in. I especially like hearing all the different languages spoken while I’m there. 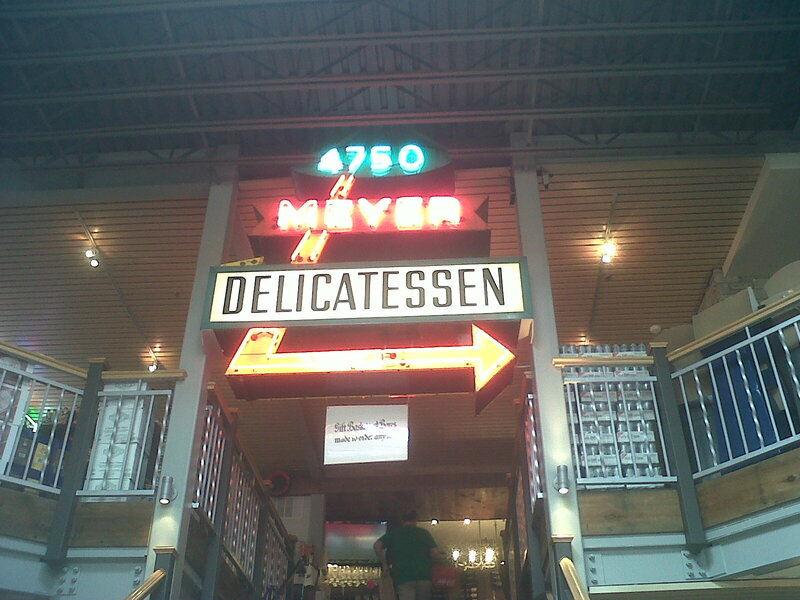 Even though I’m not a huge meat eater anymore, I’m always intrigued by their huge deli selection. They also recently opened up their rooftop. We just took a quick peek this weekend and it was beautiful! Lots of tables, umbrellas, and bars. It had wood everywhere, floor, walls, tables…which made it feel slightly like a sauna on the toasty hot day we stopped by, but that’s ok. They serve all the usual German beers and foods: brats, schnitzel, pierogis, goulasch, and sauerkraut. Not exactly my cup of tea, but I’m sure it’s delish if you enjoy all those hearty German foods. I’m looking forward to spending a sunny afternoon up there sometime soon with a nice cold beer. We rounded out our walk around the neighborhood, walking about three miles total. Not a bad way to get some exercise in on the weekend and spend some quality time together! They were light and crunchy and quite good! We didn’t eat all of it, and I made the mistake of trying them second day…ummm, not so crispy. Oh well. Eat ’em up while they’re good!! The tilapia and salsa recipe we tried is from a blog I completely love, How Sweet It Is. Jessica makes sooooo many delicious recipes and nothing is that fake flavor, low-fat, low calorie stuff. It’s all the real deal. It’s just about moderation in life, right?? 🙂 We’ve made quite a few of her recipes. She was inspired to make her blueberry salsa after visiting northern Michigan on vacation. Yay Michigan!! 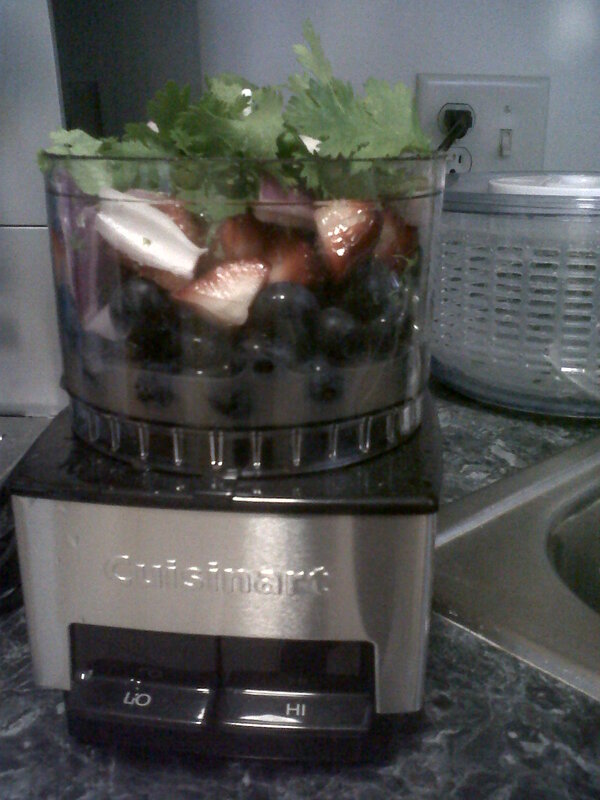 It sounded so refreshing and delicious, I definitely wanted to try it. Plus, we’re always looking for new ways to prepare our fave fish. 60 minutes before cooking,season tilapia filets with salt and pepper then lay in a baking dish or into a large ziplock bag. In a bowl, combine olive oil, honey, lime juice and zest, and crushed garlic and whisk until combined. Pour over tilapia and let marinate for an hour. Add flour [+ a bit more salt, pepper, and lime zest] to a bowl and set aside. Heat a cast iron skillet (or a non-stick skillet) over medium-high heat and add olive oil. Dredge each piece of tilapia through the flour until you have a very light coating. Making sure the pan is hot, add tilapia to the oil and cook until flaky and crispy on each side – about 3-4 minutes per side. Remove tilapia from pan and let drain on a paper towel for a few minutes. Serve with an additional drizzle of lime + honey, then cover in blueberry lime salsa. We made enough that we had salsa leftover for my lunch today with tortilla chips and the leftover piece of tilapia and more salsa for dinner tonight! Woohoooo! So, after a fun weekend, we have some more new recipes planned for the week. Get excited!!! I have been experimenting with cooking new types of food recently, and I really like it! I think Michael is just along for the ride until we figure out the best way to season it, but that’s ok with me. About a month or so ago, we tried quinoa (I learned it’s pronounced KEEN-wah) for the first time. I absolutely loved it. When you cook quinoa, the outer germ surrounding the seed breaks open to form a crunchy coil while the inner grain becomes soft and traslucent. I found this new kind of 2-in-1 texture is really interesting and actually quite liked it. A recently rediscovered ancient “grain” native to South America, quinoa was once called “the gold of the Incas,” who recognized its value in increasing the stamina of their warriors. Not only is quinoa high in protein, but the protein it supplies is complete protein, meaning that it includes all nine essential amino acids. Not only is quinoa’s amino acid profile well balanced, making it a good choice for vegans concerned about adequate protein intake, but quinoa is especially well-endowed with the amino acid lysine, which is essential for tissue growth and repair. In addition to protein, quinoa features a host of other health-building nutrients. Because quinoa is a very good source of manganese as well as a good source of magnesium, iron, copper and phosphorus, this “grain” may be especially valuable for persons with migraine headaches, diabetes and atherosclerosis. Quinoa can help migraine headaches, cardiovascular health, and gallstone prevention. So, I love cooking quinoa and figuring out different veggies, meats, proteins, spices and sauces I can add to it. It’s also great to use the plain leftovers to create new dishes, like breakfast porridge. Porridge?? Really?? Yes, porridge. You just have to add a little bit of soy or nut milk to the leftover quinoa and reheat it. Its really tasty if you add dried fruits, nuts or cinnamon too. This was when we made it the first time. 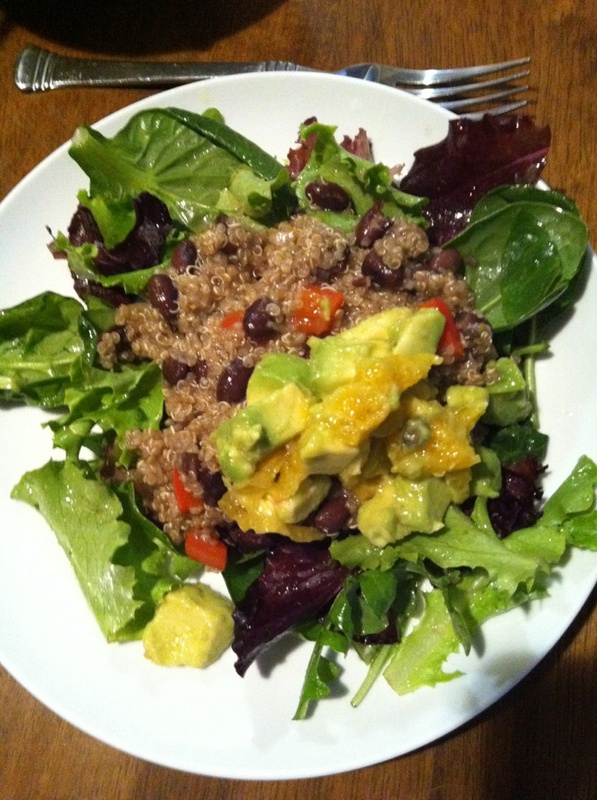 Quinoa, black beans, spices, and veggies with an avocado and orange salsa on the side. All on a bed of mixed greens and homemade vinaigrette. The recipe was from www.NoTakeOut.com, which is fabulous. I subscribe to their emails and it’s a great way to find new recipes that don’t seem too difficult. It gives you all the ingredients and tips you need, and even suggests a dessert and an adult beverage to serve with the dinner…and drink while cooking! 🙂 Shhh, I didn’t tell you that! Core, seed and dice the red bell pepper. Peel and mince 1 clove garlic. Peel and mince 1 of the shallots. Peel and thinly slice the second shallot. Rinse and spin dry the salad. Tear it into large bite-size pieces. Rinse and pat dry the cilantro. 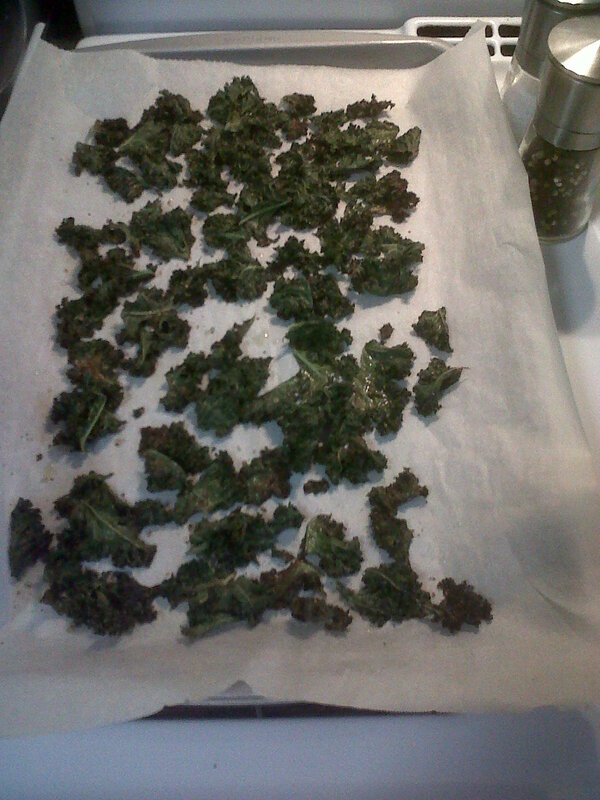 Pluck 1/3 cup leaves. Zest half the orange, and mince the zest. Rinse the quinoa, really well. Put 2 tbsps. oil, the bell pepper, the onions and the garlic in the large saucepan over medium-high heat. Stir and cook until the onions begin to turn translucent, stirring almost constantly. Add the quinoa, 1 tsp. 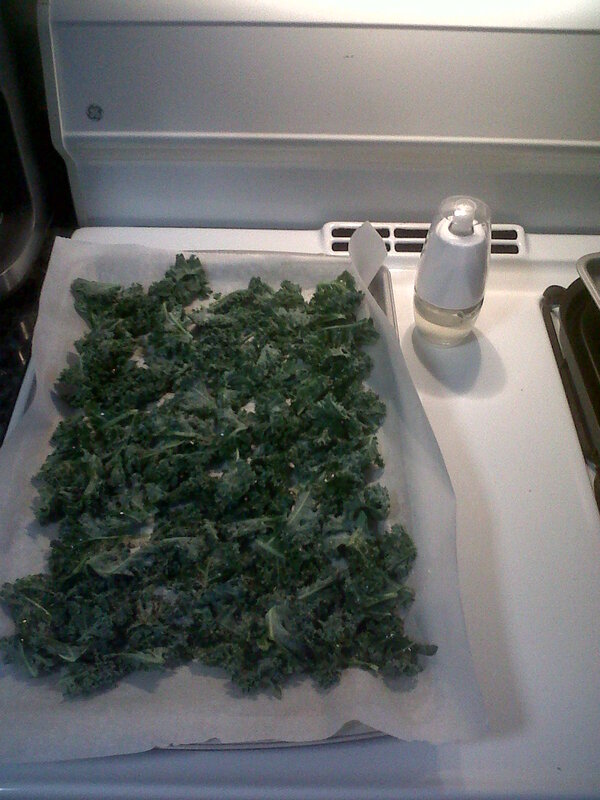 oregano, scant 1/2 tsp. cinnamon, 1/2 tsp. chili powder, a generous pinch hot paprika and the orange zest. Stir well. Pour in 2 cups water and add a heaping 1/4 tsp. salt. When the water comes to a boil, reduce the heat to medium-low, cover and cook the quinoa for 12 minutes. Remove from the heat. Don’t even look at the quinoa – it needs to plump in peace, for at least 7 minutes. While the quinoa is cooking, make the vinaigrette. Put 1 tbsp. vinegar in a large bowl. Whisk in a large pinch of salt, the sliced shallot and 1/4 cup olive oil. Taste for seasoning. You can finish up the avocado condiment now too. Peel, seed and dice the avocados. Put them in a bowl. Squeeze half a lemon through your fingers over the avocado. Peel the orange right down to the fruit (remove all the white pith). Cut the orange in slices, then dice it and add to the avocados, along with the minced shallot. Toss. Season with 1/4 tsp. cumin and a generous sprinkling of salt and toss again. Drain the black beans. Fold them into the quinoa along with the cilantro. Taste for seasoning. Set the table now, letting the quinoa and black bean mixture cool to warm room temperature. Toss the salad, thoroughly. Divide it among four plates. Top with a generous serving of the quinoa and black beans and a generous portion of the avocado condiment. Garnish each plate with a sprig of cilantro and take them to the table. Dinner is served. Ours turned out looking pretty darn good. 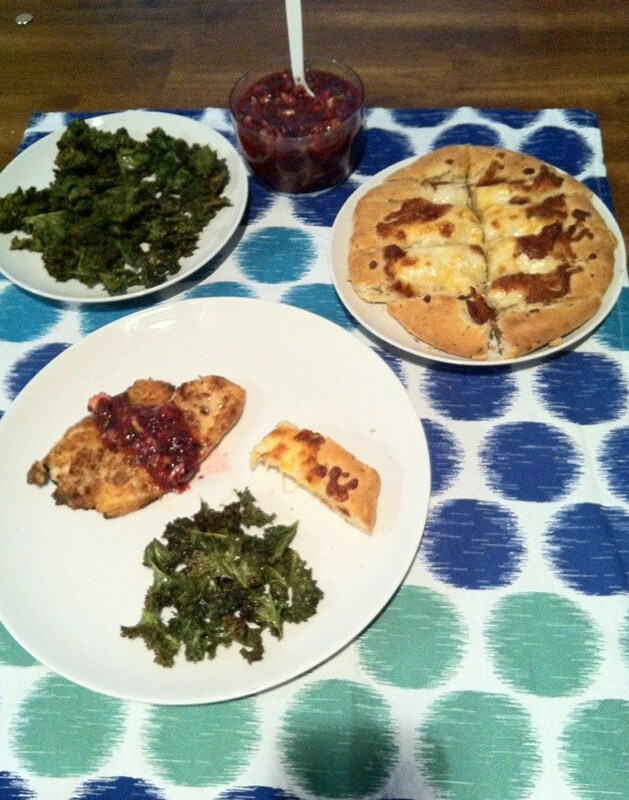 I mean…look at ours compared to the recipe picture! Close, right?? We left out the cilantro and shallots, since neither one of us is a big fan. That didn’t affect the end result too much. And I believe we opted for a mighty fine Two Brothers beer for this dinner. Yummmmm-O! Quinoa might sound weird, or look kinda iffy…but you should give it a try! What’s the worst that could happen!